Relegation-threatened Blackburn remain in the Championship's bottom three after a drab goalless draw at Wolves. In a game of few chances, Rovers' Lucas Joao saw a late header land on the top of the crossbar, as the match finally opened up in the closing stages. Wolves' only shot on target came in stoppage time, as David Raya saved from Ivan Cavaleiro at the near post. Tony Mowbray's side remain 22nd, two points below 21st-placed Birmingham City, who have a game in hand. 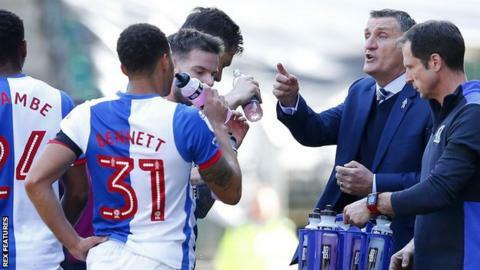 The draw extended Blackburn's unbeaten run to three games but, with fellow strugglers Nottingham Forest, Bristol City and Burton Albion all winning at home, it was a bad day for Rovers. Wolves, who had won six of their previous eight games, were uninspiring in a relatively even encounter. Craig Conway half-volleyed wide for the visitors with arguably the best chance of a scrappy first half. Rovers introduced joint-top scorer Danny Graham from the bench in the second half but he was unable to propel them to a second straight away win. Wolverhampton Wanderers manager Paul Lambert: "I thought the game was really poor. We fell below the standards that we have set. It is another clean sheet. But I have seen the stats and we never did enough to win it. "I thought we fell short of the energy levels that we have shown. The lads have played a lot of games and we need that bit of freshness for the last few games. The lads are running on empty. "You can get games like that when you think 'where is my energy?' I understand that but the pleasing thing is that we never lost it, so credit to them for that. But the positive side is that it is another point." Blackburn manager Tony Mowbray: "The dressing room is pretty desolate. It's pretty disappointing for us all in a game that we felt we should have taken three points from. "We came to win and for long spells we looked the dominant outfit out there, but you win football matches in the final third - in and around the box - and we fell short in that department today. "We have Aston Villa at home next weekend. We have to be positive and try to get the three points to take it to the last day of the season and then see what happens at Brentford." Match ends, Wolverhampton Wanderers 0, Blackburn Rovers 0. Second Half ends, Wolverhampton Wanderers 0, Blackburn Rovers 0. Offside, Blackburn Rovers. Darragh Lenihan tries a through ball, but Danny Graham is caught offside. Attempt saved. Ivan Cavaleiro (Wolverhampton Wanderers) right footed shot from the right side of the box is saved in the centre of the goal. Assisted by Andreas Weimann. Attempt missed. Ivan Cavaleiro (Wolverhampton Wanderers) right footed shot from the centre of the box misses to the left. Assisted by Andreas Weimann. Attempt saved. Lucas João (Blackburn Rovers) header from very close range is saved in the top centre of the goal. Assisted by Danny Guthrie with a cross. Substitution, Blackburn Rovers. Marvin Emnes replaces Elliott Bennett. Corner, Blackburn Rovers. Conceded by Mike Williamson. Foul by Elliott Ward (Blackburn Rovers). Jón Dadi Bödvarsson (Wolverhampton Wanderers) wins a free kick on the right wing. Attempt missed. Darragh Lenihan (Blackburn Rovers) header from the centre of the box misses to the right. Assisted by Charlie Mulgrew following a set piece situation. Derrick Williams (Blackburn Rovers) wins a free kick on the left wing. Foul by Mike Williamson (Wolverhampton Wanderers). Corner, Blackburn Rovers. Conceded by Conor Coady. Romain Saiss (Wolverhampton Wanderers) is shown the yellow card for a bad foul. Charlie Mulgrew (Blackburn Rovers) wins a free kick in the defensive half. Jason Lowe (Blackburn Rovers) is shown the yellow card for a bad foul. Substitution, Wolverhampton Wanderers. Morgan Gibbs-White replaces Ben Marshall because of an injury. Attempt saved. Derrick Williams (Blackburn Rovers) left footed shot from outside the box is saved in the bottom right corner. Assisted by Danny Guthrie. Sam Gallagher (Blackburn Rovers) wins a free kick on the left wing. Danny Guthrie (Blackburn Rovers) is shown the yellow card for a bad foul. Substitution, Blackburn Rovers. Danny Graham replaces Craig Conway. Attempt missed. Romain Saiss (Wolverhampton Wanderers) left footed shot from outside the box is too high following a set piece situation. Conor Coady (Wolverhampton Wanderers) wins a free kick on the right wing. Ben Marshall (Wolverhampton Wanderers) wins a free kick in the defensive half.